The sun was certainly beating down on Sunday 9th April at our 4th Club Championship race of the year, in the little village of Hose for the Belvoir Half Marathon. A Spring favourite within the club, the flat-ish course is good for PBs and welcoming for first timers. We had good turnout of 13 club mates take on the 13.1 miles through the villages of the vale of Belvoir. It was close in the men’s race with Chris Jones finishing in a great time of 1:41:39 with Martin Gordon-Kerr not far behind in 1:42:56 . It was even closer in the ladies competition, with Helen Duncan finishing in 1:49:51 just 30 seconds ahead of Emma Potter in 1:50:23. However there were some position changes once age-grading had been applied. So in the men’s Championship, Sean McAuliffe is still in the lead with Paul and Dave Summers in 2nd and 3rd respectively. Meantime things have the potential to be even more competitive with the Ladies. Currently Helen Duncan is leading on 31 points with Kate Howes just behind. 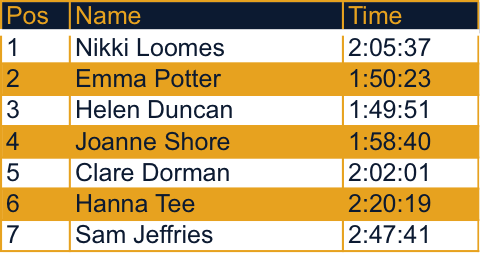 However if Jo Smith, Emma Potter and Nikki Loomes complete some more races then things could get very exciting – keep it up. The next Championship Race is the Wymeswold Waddle on Sunday 14.May. See club calendar for more details. The National Watersports Centre at Holme Pierrepont, Nottingham is reknowned for being in a rather exposed location weather-wise and even on a calm day there is always some breeze to be had. So last Sunday’s stiff breeze was always going to present a challenge to the competitors for the Clough/Taylor 10k that involved 2 laps of the Regatta lake and hitting a stiff head-wind at least twice.